Beginning this fall, I am delighted to offer an evolving/revolving selection of my new originals at very special prices. 'Buds, Blossoms & Blissfuls'... magic comes in three flavors! 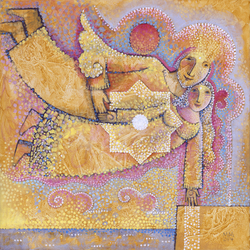 Take a look, perhaps one of these jewel paintings speaks to your heart? If you find yourself inspired to bring one home, either for yourself or for a loved one, please contact me for more information. 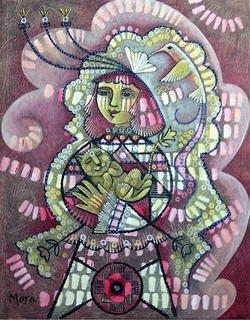 My new works celebrate the wonders of life experienced thru a character I call 'earthstar daughter'. 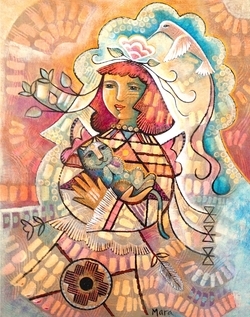 In her playful and musical world, she dances with sky and stars, dappled light, sacred symbols, cloud-flowers, babies and animal friends. Scroll down to view my painting specials and learn more about their inspirations. This painting is inspired by my recent trip to the majestic California redwoods. This precious and rare ecosystem feeds the depth of soul and height of spirit of all who are blessed to visit. Earthstar daughter along with her beloved companions shimmer in the temple of Life! BUD 3 ~ 'Forest Friends' ©2015 Mara Berendt Friedman, 11" x 14"
Within the embrace of a gentle cloud-flower, earthstar daughter carries her rich summer harvest and drinks in the crisp autumn air. A golden flower blossoms from her crown and sprouts tendrils of joy.Buddha cat, her beloved companion, is so happy at the return of fall that she takes wing and begins to fly! LIFE sings around and within these wonderful friends. BUD 1 ~ 'Song of Glory' ©2015 Mara Berendt Friedman, 11" x 14"
My new works have many recurring themes. 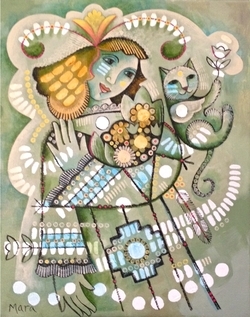 You will often see buddha cat tenderly held by earthstar daughter, showing compassion for self and other. A flower blossoms from her crown, representing the flowering of our consciousness in unity with ALL. 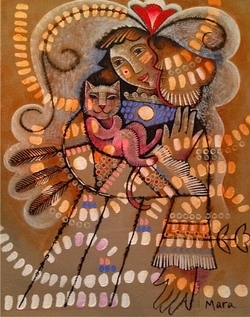 BUD 2 ~ 'Sweet Friends' ©2015 Mara Berendt Friedman, 11" x 14"
Golden buddha cat is tenderly held by noble earthstar daughter. Spirit hummingbird deeply drinks the sweet nectar of love... earth feeds heaven and heaven feeds earth... a great circle of nourishment! From her white crown flower sprouts 3 antennae of Sacred Feminine awakening, reaching into the swirling song of life, listening for notes of wisdom. 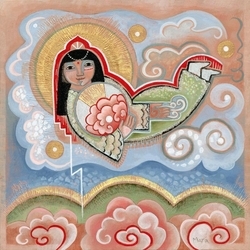 She is embraced by a rose cloud-flower of protection. 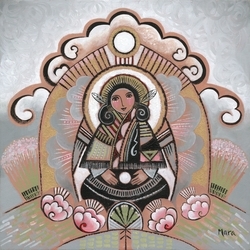 The sacred chakana symbol resides at her root, gifting her with grounded strength. The chakana, seen all over Peru, is also known as the Incan cross. This magic and ancient symbol has a myriad of meanings. For me it represents, among many other things, the four directions of Mother Earth and our open human heart residing at Her center. BLOSSOM 1 ~ 'Lifestream' ©2015 Mara Berendt Friedman, 14" x 18"
This is the second exploration of the BUD painting Sweet Friends (above). Here our earthstar daughter once again travels with her beloved companion golden buddha cat. Her other favorite companion, spirit hummingbird, drinks nectar from her crown flower and another layer of protection, in the form or a golden cloud-flower, embraces them all as they journey thru the magic and musical lifestream. BLOSSOM 2 ~ 'Seated Daughter' ©2015 Mara Berendt Friedman, 14" x 18"
Seated firmly on Mother Earth, our earthstar daughter and her dear companions listen to the sweet song of the universe that swirls around and within them.The sparkling sun is a blanket of warmth upon the earth and flowers rise in joy toward the light. Knowing both heaven and earth, our daughter is in harmony and balance with All that is. BLISSFUL 1 ~ 'To Cherish' © 2015 Mara Berendt Friedman, 18" x 18"
Earthstar Daughter tenderly holds her beloved daughter. 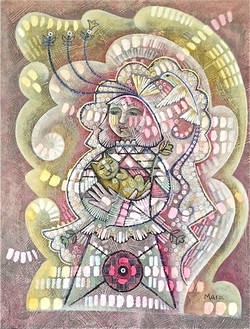 In turn mama and baby are held in the warm embrace of a cloud-flower as the music of life flows through and around them. Love within love. My painting and haiku called "To Cherish" are inspired by the understanding that to cherish the love in our lives and the Beauty of this earth brings immediate joy. BLISSFUL 2 ~ 'Surf The Universe' © 2015 Mara Berendt Friedman, 12" x 24"
Earthstar Daughter stands tall and strong on her arrow of intention. 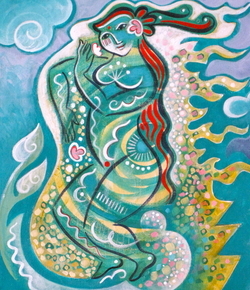 With complete balance, she joyfully surfs the song of the universe! Joining her for this magic ride is her beloved companions, buddha cat and spirit hummingbird. 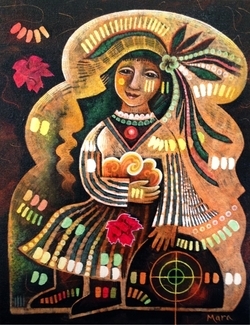 The sacred 'chakana' adorns her skirt and leaves sprout from her boots. My recent painting, completed just before Valentine's Day, is the first of my Verdant Flower Series. This original was offered for a special price of $500 and is... SOLD! The lush Beauty of Hawaii infuses this work... the island's warm sun, lush foliage and fragrant flowers. Perhaps the golden lovers are calling you to bring them home? Please contact me for more info (layaway available). This original was created on Kauai during a winter visit a few years back. Two lovers embrace and become one... there is no clear boundary where one ends and the other begins. A passion flower glows ruby at their root and a golden flame ignites at their heart. 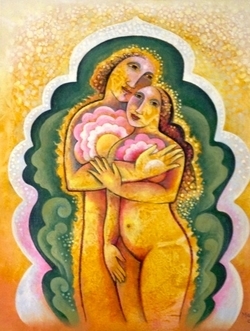 Seated within a yellow temple-womb of sunlight and warmth, the flower of their love blossoms from their crown. 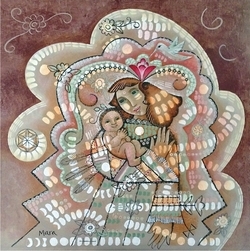 I call this blossoming collection of paintings the Trinidad Series. My first 'blossom' is entitled Come Sail With Me and is pictured here... me and my beloved rooted by one arm at the edge of the world, flying like a sail in the wind above the sea... I am pretty attached to this first painting, so decided not to offer it for sale (it will be available as a limited edition giclee print soon.) 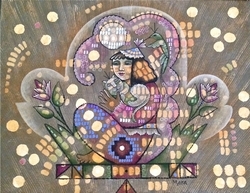 As these whimsical images birth into form, I will be featuring them on my site for sale. 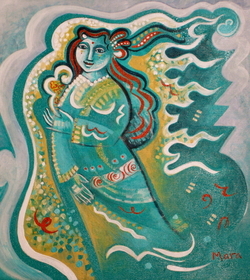 in this this painting Mary flies high above the desert rose and sage. in her heart she holds the sweet rose of tenderness. she pierces the earth below with a lightning bolt of power... her taproot of connection to gaia's wisdom. please contact me if interested in ordering a custom devotional painting like this. 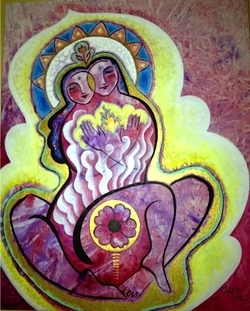 in this this painting Mary rests within the holy rose of compassion and the radiant sun pours his nectar into the sacred vessel of her body. 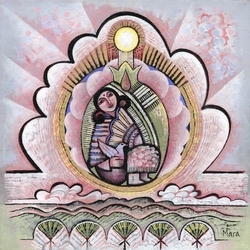 she is caressed within tender clouds as the pink light of mornng dawns over the vast desert below. in this this painting Mary serenely sits within her golden temple, which is tenderly caressed by protective clouds of compassion. pink roses bless her feet as the white spirit sun touches her crown. she is in full alignment with earth and sky! the seed flowers into being! please contact me if interested in ordering a custom painting like this.